Sound the alarm! A strange tree-shaped object outside keeps moving by the stairs, and there’s a low-flying helicopter nearby. What is the pilot doing with that chain and hook? He’s trying to break his buddy out of jail! Load the net shooter on the station roof and fire it at the helicopter, while the other officers hop in the vehicles to chase after the crooks on the ground. What's that in the cave under the jail? Eeek, it's a mountain lion, and it's ready to pounce! 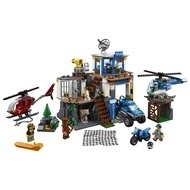 - Includes 7 minifigures: a police chief, pilot, 2 officers and 3 crooks, plus a mountain lion figure. - Features a 2-level Mountain Police Headquarters with rotating satellite dish, net shooter, garage and ramp for a vehicle, jail cell with breakout wall/door, escape ‘rope', office with desks and a cave under the jail cell with mountain lion pounce function, plus a separate helipad with ladder. 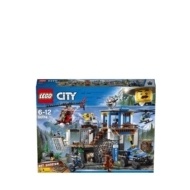 - Also includes a police helicopter with spinning rotors and opening minifigure cockpit, crooks' helicopter with spinning rotors, opening minifigure cockpit and a chain with hook, police 4x4 with tall bubble light, and a police motocross bike. - Hook the chain from the crooks’ helicopter onto the jail cell wall to break out the crook. - Take off in the police helicopter and 4x4 to chase after the crooks, then prep the net shooter and launch a net at the crooks' helicopter to force it to land. - Push the lever behind the cave to pounce the mountain lion at the crooks. - Accessory elements include 2 mugs, 2 golden bars, string net, binoculars, radio, flashlight, megaphone and 3 pairs of handcuffs. - This cool toy for kids is suitable for ages 5-12. - Police helicopter measures over 2” (7cm) high, 7” (19cm) long and 6” (16cm) wide. - Crooks' helicopter measures over 3” (8cm) high, 8” (22cm) long and 6” (16cm) wide. - Police motocross bike measures over 1” (3cm) high, 2” (6cm) long and under 1” (2cm) wide. - Police 4x4 measures over 2” (6cm) high, 4” (12cm) long and 2” (6cm) wide. - Police headquarters measures over 9” (24cm) high, 9” (23cm) wide and 6” (16cm) deep. - Police helipad measures over 2” (6cm) high, 2” (8cm) wide and 2” (8cm) deep. - As seen in the LEGO® City Police TV commercial.